The full account of this conflict, where seven unarmed Nation of Islam members were shot by the LAPD, is the starting point for Pillar of Fire, the second of Taylor Branch’s trilogy about the Civil Rights movement in the 1950’s and 1960’s. I read and reviewed the first book, Parting the Waters, last year. This account of the events of April 27, 1962 is one example of how reading history helps us understand how we got to where we are today. Pillar of Fire is full of moments of recognition, where the reader sees the DNA of today’s news in past events. 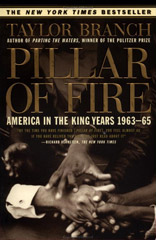 Pillar of Fire covers events from 1963 to 1965. It is impossible to recount everything that struck me while reading this book. I was highlighting passages in my Kindle edition like mad. What follows is an attempt to highlight some of the prominent narrative threads and themes I noted. There’s a reason that the recent movie Selma begins with the September 15, 1963 killing of four young girls in the bombing of 16th Street Baptist in Birmingham. It is an event that reverberated throughout the civil rights movement, even though it didn’t quite shame the nation into repentance. The lack of justice for the 16th Street Baptist bombings is a shadow throughout the book. (No one was convicted for the crime until 1977.) This injustice is joined by the lack of justice for NAACP leader Medgar Ever’s 1963 assassination (no conviction until 1994); the 1964 murders of civil rights workers James Chaney, Andrew Goodman and Mickey Schwerner (those few of the lynching mob who are convicted in 1967 do not serve more than six years in prison). In an epilogue, Branch also describes the 1966 Klan killing of Mississippi voting rights activist Vernon Dahmer, and how three of the four convicted were pardoned after only four years in prison by the state governor. The KKK leader, Sam Bowers, who ordered the murder was tried for the crime, but deadlocked juries kept him from conviction. In 1998, the case was reopened and Bowers was finally convicted of Dahmer’s murder. The galling fact is that if anyone was suppressed by big government intrusion, it was Rev. Martin Luther King, Jr. It is well-known now that Dr. King was under almost constant FBI surveillance. The loathsome and powerful FBI director, J. Edgar Hoover directed this surveillance and also authorized releases of scurrilous information about King to the press (false accusations of Communistic ties, true accusations of infidelity). Hoover tried to prevent King’s meeting with the Pope and in a press interview, Hoover called King “the most notorious liar” in the United States. Again, the FBI’s surveillance of King is no longer a secret, but I was still surprised and horrified by the persistence, extent, and petty exploitation of it. The in-depth nature of Pillar of Fire also alerted me to historical events I’d never heard of. I had no idea about the integrationist movement in St. Augustine, Florida, for instance, which called out the fact that the oldest city in the United States remained segregated. I also did not know about the jailing of voting rights activists from Greenwood and Itta Bena, Mississippi (for “disturbing the peace”). Some of these activists were imprisoned in the notorious Parchman Penitentiary, where they were sometimes kept in hotboxes, and also hung by their hands in their cells. I didn’t know about the Mississippi Freedom Democratic Party delegation that sought seats at the Democratic National Convention, and were denied their place in the political process. And though I knew of Malcolm X, I didn’t know many details about what he did and said. As I said about the first book, I feel like Pillar of Fire has helped me understand my country better. Not to sound hyperbolic about it, but in some not-fully-realized way, I feel like these books have changed my life. So this post is definitely inspired by a blogger event hosted recently by Trish at Love, Laughter, and a Touch of Insanity. The basic gist is that bloggers would capture notes about a regular day in their lives as a way of connecting more in the blogger community. I was out of the loop and missed participating in the event, but thought I’d record a day anyway. (Partly, this is stalling as I’m currently reading a very long book and don’t have any other books to review.) The day I picked to record was yesterday, Thursday, April 2nd. 6:45am – After spending a while listening to news on the radio (which is what I wake up to), I finally get out of bed. I take a quick shower (not a hair-washing day), iron my dress pants, open the blinds for my plants, among other routine tasks. 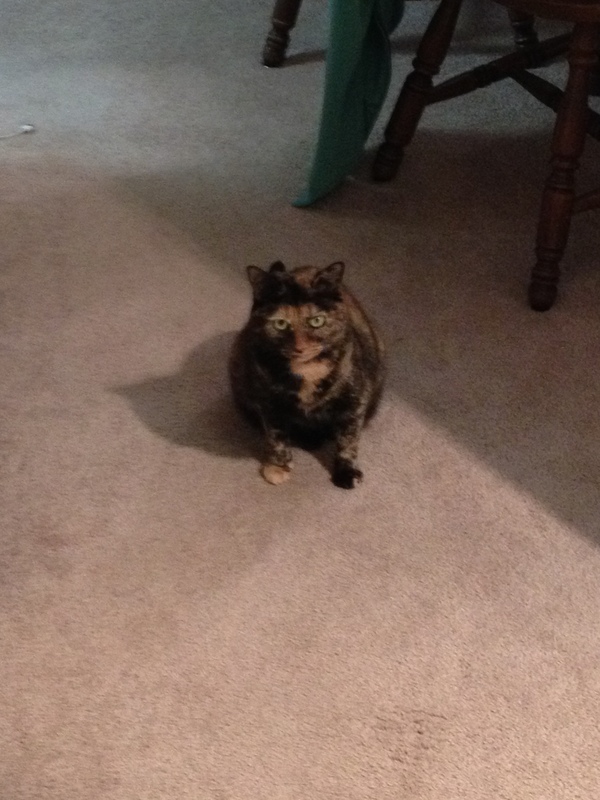 As I move about the apartment, my cat Bean sits and stares at me, as if in judgment. This is a normal part of my mornings. I go to pack my lunch, and realize I’m out of bread. Fortunately, I have a cold smoked mozzarella pasta salad I treated myself to from Whole Foods, and so I put some of that into a smaller container to take with me. I also add tortilla chips and one of those individual snack-size guacamole tubs to my lunch bag, which doesn’t pair especially well with the pasta salad, taste-wise, but that’s what I’ve got. 7:19am – Leave apartment much earlier than normal mornings because I need to go get my blood drawn at a lab as the second part of my routine physical. I had eaten something the actual morning of my physical two weeks ago, and so couldn’t get the blood drawn then as it requires a preceding fast of twelve hours. 7:24am – Arrive at lab. Two vials of blood drawn expertly (the woman who performed it cheerily said afterward “you’ve been served!”). 7:33am – Leave lab. Realize on drive to work that the commute is uncommonly good because it is spring break for the county school system. 8:00am – Arrive at my desk at work. Normal arrival time is usually 8:30 to 9:00 so I feel really good. Pregnant co-worker stops by to share the latest work news, looking fabulous in a black maternity dress. I tell her so. Co-worker: Yeah, this is pretty much what I’ll be wearing all summer. Other, more heavily pregnant co-worker is pulled into the conversation, and they both discuss the weird pregnancy dreams they have been having. 9:50am – Go to use the bathroom only to find that it is closed and it appears that it is being taken apart – dispensers are all on the floor, etc. I keep walking and run into a coworker who tells me that our bathroom may be closed the rest of the day. I go up a floor but that bathroom is also closed, and I wander down the hall on that floor and finally find a open bathroom. Feel sorry for pregnant co-workers. On return to my desk, I briefly check my personal email and see that my church’s secretary replied to a hasty email I had sent the night before. She lets me know that my emailed submission of the handbell choir’s song title wasn’t too late to make it into the Easter Sunday bulletin. I get back to work. 11:08am – A weekly meeting that I thought had been canceled turns out to be back on. I summon my work-twin (we have the same position and are sometimes treated as the same person. We accept this.) and we go into the conference room. We are there to discuss issues related to the new system we started using a few months ago. We haven’t properly had this meeting for a couple of weeks and have been saving up. Meeting doesn’t end until 12:22pm. 12:40pm – Eat lunch while doing some data quality work. 1:10pm – Work-twin and I go for a walk outside. It is sunny, not cold, but very windy. Among other topics, we lament the despairingly high cost of houses in the D.C. metro area. 1:40pm – Return from walk. Go on to have a very productive afternoon, which continues what has been a very productive week, which may or may not be related to the fact that there have barely been any meetings. I make a lot of strides on projects that had been regrettably on the back-burner up until now. 4:30ish – Arrive home. After I’ve parked and turned off the car, my cat jumps to the windowsill and offers more looks of judgment and meowing that I cannot hear. 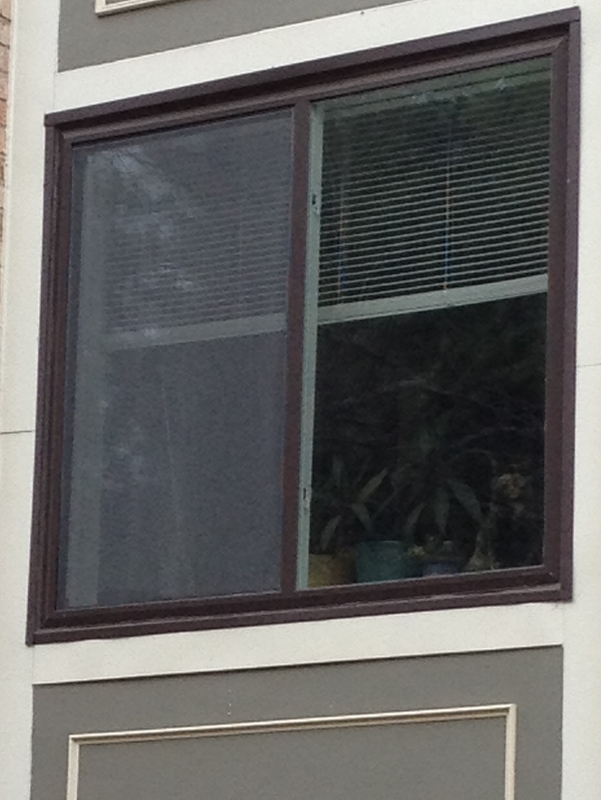 I suspect she does this for anyone who pulls up to the apartment building, but I like to pretend she knows it’s me. After compulsory rounds of email, Facebook and blogs, I engage in minor tidying-up tasks: putting away dishes, washing others; attacking the paper detritus on the table. Sorting through the detritus reveals several mailed requests for donations. I do write out a check for one of them: my local volunteer fire department. I feel particularly moved to do so as they responded to my apartment several weeks ago when some wires burned in the electrical closet. As I do these things, I listen to Reading the End’s bookcast (with Gin Jenny and Whiskey Jenny), episode 36. 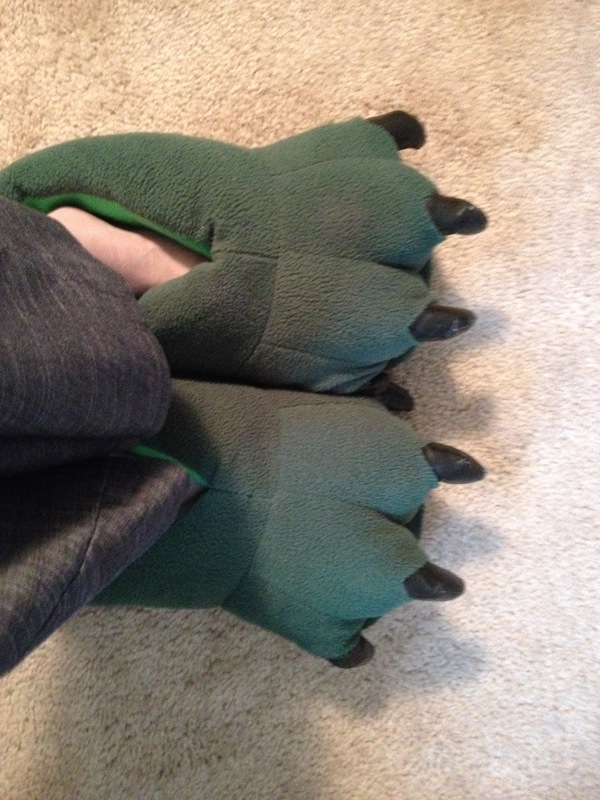 Also, because my feet are cold, I wear my T-Rex/Godzilla slippers. 6:05pm – Finish off the last of a large salad I had made a couple of days ago. It’s still pretty good, though it is clear it wasn’t going to hold up much longer. I also steam some store-brand potstickers in the microwave for the rest of my dinner. 6:40pm – Leave to go to church for Maundy Thursday service. 6:55pm – Arrive at church. The service is thoughtfully led, but I can’t seem to get quiet inside, and feel distracted. 8:00pm – Service ends. I stay after for a late choir rehearsal. Before we start, a card is passed around for a choir member who recently had a baby (his second). 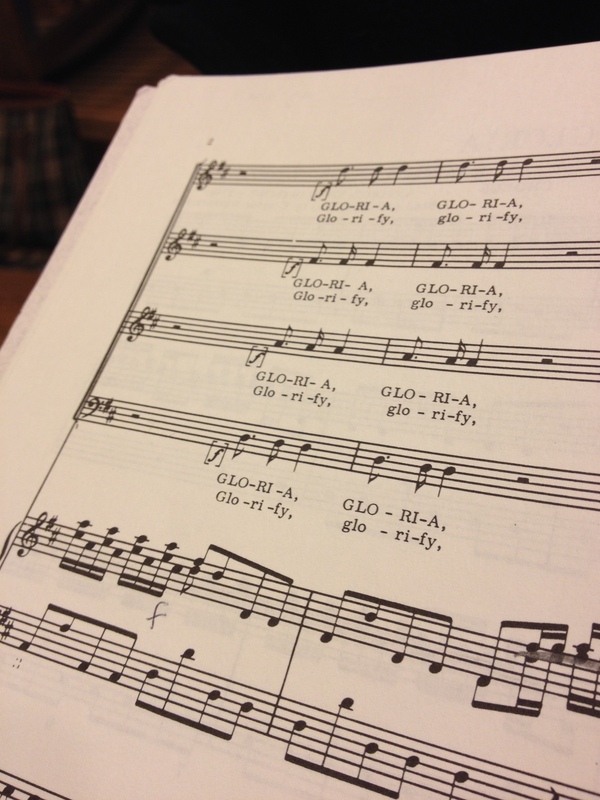 We are rehearsing our piece for Easter, which is the first movement of Vivaldi’s Gloria. Everyone seems a little tired. 9:30pm – Arrive home. Last rounds with email, social media, etc. 10:04pm – Turn off computer. Get ready for bed. 10:34pm – In bed. Read a chapter of Taylor Branch’s Pillar of Fire. **This was one version of a typical day for me. My other version, when I don’t have anything going on in the evening, involves a lot more internet and Roku.